They glimmer a pale blue colour as they sit nestled in tranquil valleys bordered by tall green pine trees. They are guarded by the peaks of the surrounding Rocky Mountains, which always seem to be lightly coated by fluffy snow sprinkled like icing sugar. They are often outlined by tourists hoping to capture the light, the colour, the image, and most of all the spirit so that they can show their jealous friends upon their return home. They are majestic and raw. They are the lakes of the Canadian Rockies. The excited guides explain that the colour of the water is a result of floating limestone rock flour, which reflects the turquoise shade that is soaked in by the eyes of visitors. But from above it seems impossible, the lakes seem to full of colour, of texture, of life. They look as though the liquid which puddles in these glacially created depressions isn’t water at all; instead it is thick blue syrup derived from fairytale stories. To describe the colour in words is pointless, but the views too, more often than not, seem too unreal to believe. The only true way of experiencing the view and the feel of this amazing place is by standing on a cliff side looking down and drinking in the view in person. Standing tall and proud above the lakes, great mountains jealously seek to steal the visitor’s attention. They are charming as well, however as raw and powerful as they may be, they seek to exude a sense of calm, and they certainly force a humble feeling on all visitors. Generously thick glaciers find their homes on top of the mountains and stretch out into the valleys like a cold hand desperately holding on to its possession. The cool summer air refreshes the senses and persuades a sense of calm and tranquillity only until the great thunderous sound of an avalanche shooting down the slopes breaks the steady air. As the night begins to draw out the evening moon, the sun finds refuge behind nature’s mountain wall and rays of white light jut between the clouds. The peaks glow a bright orange as their imposing shadows cast shade on their neighbours. At night there is a sense of calm that crawls over the senses of the many intruders to nature’s realm. Sharp winds carrying air from the glaciers glides along the lakes with a freshness only dreamed of being controlled by the producers of car fresheners. But it is the morning, yes the morning, where the true rewards are found on the lakes of the Canadian Rockies. As the sun prepares to start its daily ritual of chasing the stars and moon into hiding, birds begin to chirp their morning hymns. Light mist rises magically from the silky smooth water as a deer awkwardly hops through the tall wet grass. And just as the sun returns to its rightful place in the sky an eerie calm sets over the waters of the lakes. A calm so powerful that, like sheets of a princess’ finest mirror, all of the Rockies’ majestic image is reflected, as if seeing this beauty in only one view wasn’t enough. 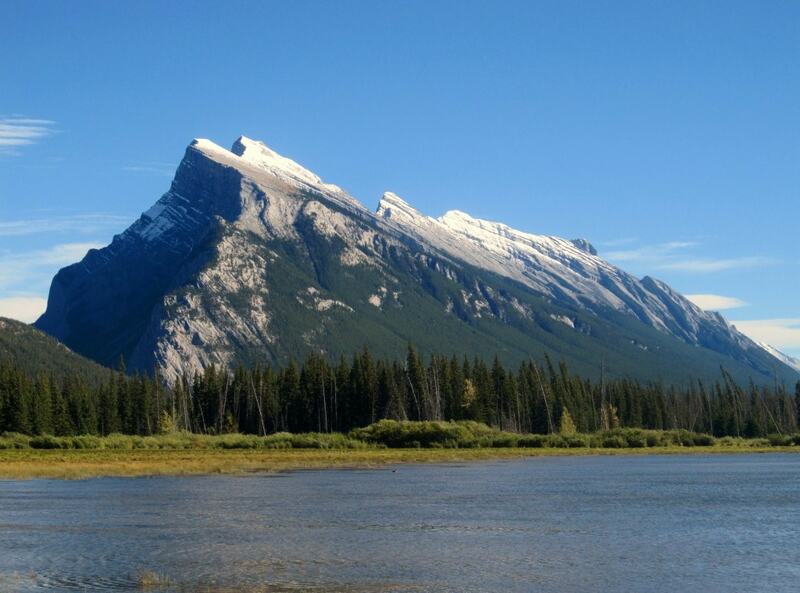 These are the Canadian Rockies, majestic and proud, awe inspiring and humbling, royal and great. The Rockies are one of my favorite places to visit! Beautiful photos! I lived in Banff many years ago. You never get tired of the views. Lovely post. Did you venture beyond Banff and up into Jasper National Park? Maligne Lake (where I work) is one of the gems of the Canadian Rockies … if you’re back one day, go on a backcountry canoe trip and you’ll see how aquagreen a Rocky Mountain lake can get! I actually used to work for Brewster as a driver/guide while I was going through university, so I spent tonnes of time up there as you can imagine. Also ran the North skyline trail 3 times.